Sauger are highly migratory members of the true perch family, Percidae. They resemble the closely related walleye and typically inhabit large, turbid rivers, lakes, and reservoirs. They occur across central and eastern North America, and are popular sportfish in much of their range. They were once common in the Great Lakes, St. Lawrence River, and Lake Champlain watersheds of New York, but these populations have declined to the point that perhaps only a small remnant population in Lake Champlain still exists. Sauger are now considered critically imperiled in New York State. A Sauger Conservation Management Plan was implemented in 2013 with a goal to establish and maintain self-sustaining sauger populations in all suitable waters of native watersheds. Initial actions are focused on the Allegheny River and Lake Champlain watersheds, where suitable habitat and adjacent populations suggest recovery is achievable. Sauger in the lower Allegheny River in Pennsylvania are restricted from moving into the New York portion of the river by the Kinzua Dam. Therefore, in 2014 DEC began a 5 year stocking program to establish a population in the watershed above the dam. Fry (newly hatched fish) for the program have been obtained from the West Virginia Division of Natural Resources and the Kentucky Department of Fish and Wildlife Resources, and raised at the DEC Chautauqua Fish Hatchery. Over 17,000 pond-raised fingerlings (1.5 inch) and 700,000 fry were stocked in the Allegheny Reservoir from 2014-2018. Surveys have indicated that the stocked fish are surviving and growing well. Sauger from all five years of stocking are present in the reservoir and fish from the first year of stocking are now reaching over 20 inches, an impressive size for sauger anywhere in the country! Possible sauger spawning activity was even observed in the river this past spring. While these are encouraging signs, the stocking program will continue for several more years to achieve the goal of creating a self-sustaining population. Sauger may still occur in Lake Champlain but, because only one fish has been collected during surveys over the last 20 years, this population is at risk of extirpation. In collaboration with the US Fish and Wildlife Service (USFWS), the Vermont Fish and Wildlife Department, and the Quebec Ministry of Forests, Wildlife and Parks (QMFFP), a stocking program to restore this population is currently being developed. In May 2017, DEC Fisheries staff traveled to Lake St. Pierre in Quebec to determine if the sauger population could be used as a source of fish for the Lake Champlain restoration program. 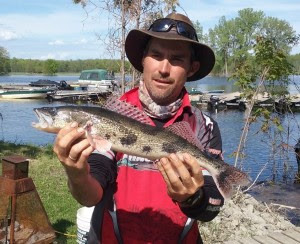 With help from Biologist Philippe Brodeur (QMFFP) and local guide Alec Delage, 60 sauger were collected from several locations in the Archipelago area of the lake. Information on spawning locations, collection and processing methods, spawning stage, and fish size and condition was obtained. Collected fish were sent to the USFWS Fish Health Center in Lamar, Pennsylvania to check for the occurrence of diseases, and fin clips were taken to assess the genetic suitability of this population for Lake Champlain restoration. All of this information will be used to develop the most appropriate restoration plan.